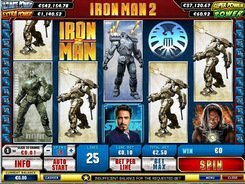 The five-reel 25-payline Iron Man 2 slot machine from Playtech is based on a legendary Marvel comics and not less iconic American superhero film. 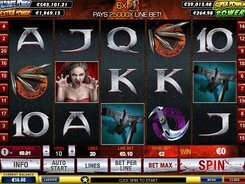 The feature-packed slot has fantastic graphics and thrilling animation. The bet per spin starts from $0.01 and reaches $250. 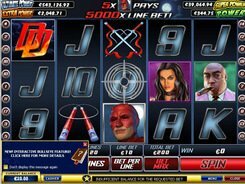 In this video slot you will encounter well-known characters of Black Widow, Tony Stark, Iron Man, Whiplash and a few powerfully armed robots. The S.H.I.E.L.D. Agency Logo is the wild symbol that can replace regular symbols of the game. 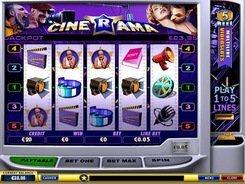 The scatter is represented by the Iron Man emblem that opens up ten free spins, once three or more of them land anywhere on the reels. 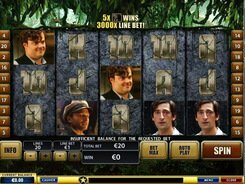 Free spins start with a x2 multiplier, and every two spins the multiplier increases by x1. 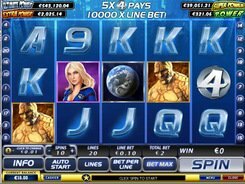 All Marvel slots, including this one, are a part of Mystery progressive jackpots. In the jackpot game you have a grid of 20 tiles hiding various symbols. Match up three identical icons to win the grand cash prize. PLAY FOR REAL MONEY!